Marion Zimarai Hinshaw5,6 [Marion Zimri Hinshaw7]. Hinshaw, Z. Marion, son, age 21, born in Indiana; parents born in Indiana; occupation: salesman, cash register. James, Alfred E., head-of-household, age 36, born in Connecticut; occupation: stock clerk, register factory. James, Minnie, wife, age 30, born in Connecticut. Hinshaw, Marion Z., lodger, age 21, born in Indiana; parents born in Indiana; occupation: mechanic, register factory. Hinshaw, Marion Zimri, age 28, born June 15, 1898 in Winchester, Indiana; married; address in the U.S.: 913 Liberty Ave., Pittsburgh, Pennsylvania. Hinshaw, Marion Z., head-of-household, age 31, born in Indiana; parents born in Indiana; first married at age 24; rented home ($33.00 rent); radio in home; occupation: mechinist, cash register; not a veteran. 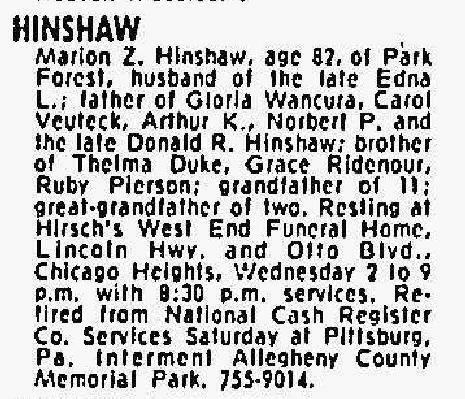 Hinshaw, Edna H., wife, age 32, born in Pennsylvania; parents born in Germany; first married at age 24. Hinshaw, Donald R., son, age 5, born in Pennsylvania; father born in Indiana; mother born in Pennsylvania. Hinshaw, Gloria A., daughter, age 3 years 11 months, born in Pennsylvania; father born in Indiana; mother born in Pennsylvania. Hinshaw, Arthur K., son, age 1 year 6 months, born in Pennsylvania; father born in Indiana; mother born in Pennsylvania. Henshaw, Marion Z., head-of-household, age 42, born in Indiana; completed 4 years of college; on Apr 1 1935 was living in the same house; owned home ($4000 value); occupation: service manager, register co.; worked 52 weeks in 1939; $2500 wages in 1939. 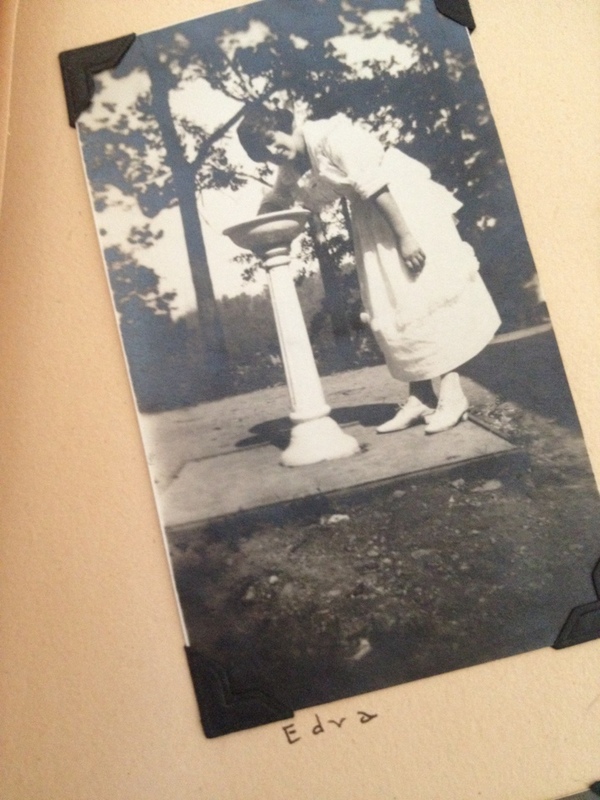 Henshaw, Carol, daughter, age 3, born in Pennsylvania. Marion's obituary was published in the "Chicago Tribune" (Chicago, Illinois) on July 9, 198019 (see scan below). 1940 census, 20th Ward, Pittsburgh, Allegheny County, Pennsylvania; roll T627-3670, ED 69-614, page 2A, line #24, household #28. 1930 census, 19th Ward, Pittsburgh, Allegheny County, Pennsylvania; roll T626-1981, ED 308, page 4A, line #1, dwelling #37, family #43. Obituary of Donald Richard Hinshaw. 1920 census, Dayton, Montgomery County, Ohio; roll T625-1421, ED 154, page 6B, line #56, dwelling #86, family #148. 1920 census, Green Township, Wayne County, Indiana; roll T625-473, ED 145, page 3B, line #53, dwelling #67, family #67. Ancestry Family Tree data "Ruehrshneck (Rushneck) Family Tree" posted by "grushneck1". 1900 census, 6927 Susquehanna St., 21st Ward, Pittsburgh, Allegheny County, Pennsylvania; roll T623-1362, ED 256, page 6A, line #24, dwelling #90, family #101. 1920 census, 1216 Hillsdale Ave., Dormont, Allegheny County, Pennsylvania; roll T625-1511, ED 881, page 8A, line #8, dwelling #165, family #210. New York, Passenger Lists, 1820-1957; http://www.ancestry.com. Cook County, Illinois Death Index, 1908-1988; http://www.ancestry.com.